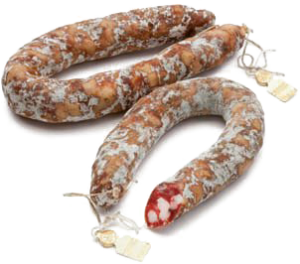 Sweet or Spicy, Nebrodi Black Pig Dried Sausage offers itself to be used both in appetisers and in first courses and also in a lot of other preparations. This procedure is still used today. Indeed inside our laboratories you can find sausages still hanging from the ceiling, well spaced one from another. And I’ll tell you more: the airing is constant without using any ventilation system. So our secret is the seasoning process. This one lasts from 20 to 25 days. After this the product is just ready to be tasted and relished. You can match it with mushrooms, with pasta and courgette and also with scrambled eggs just to mention some. Appearance: cylindrical horseshoe in shape – the dried sausage is bent by hand with the ends tied with natural twine. Appearance of cut: Coarse-grained, dark red with white lard inside.